Pag-angat ng bawat pamilyang Pilipino. 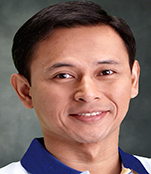 Ito ang pangunahing adhikain ni Senador Sonny Angara sa bawat batas na kaniyang isinusulong. Sen. Sonny is known as among the most hardworking and productive members of Congress, having sponsored or authored more than 80 laws in his 14 years as legislator. Like his parents, former Senate President Edgardo Angara and teacher Gloria Manalang, he values education as a tool to fight poverty. Sen. Sonny pushed for laws to widen access to education through the passage of the Free College Law, and the Unified Student Financial Assistance System Act (UNIFAST) to ensure that scholarships go to poor and deserving students. He is also one of the authors of the Universal Kindergarten Law, the Ladderized Education Act, the Open Learning and Distance Education Act, Youth Entrepreneurship Act, the law integrating Moro history in the school curriculum, and laws to create universities in far-flung rural areas. Sen. Sonny believes that given the right opportunity, Filipinos will have a better quality of life. Thus, he authored laws to ensure sustainable jobs and decent working conditions: the law creating Public Employment Service Offices (PESO) nationwide, the JobStart Law and the revised Special Program for the Employment of Students (SPES) to help ease youth unemployment. He led the passage of the law that raised workers’ take-home pay, the 13th month pay and other bonuses by lowering and simplifying income taxes. He also sponsored the law strengthening the Overseas Workers Welfare Administration (OWWA) to provide greater OFW representation and benefits, the Seafarers Protection Act, and the law that made OFW balikbayan boxes tax-free. Senator Sonny champions laws that empower women (the Magna Carta of Women), senior citizens (Expanded Senior Citizens Act), persons with disabilities (Act Expanding the Benefits and Privileges of PWDs), and the informal sector (Magna Carta for Workers in the Informal Economy bill). Moreover, he is advocating for bills that would improve healthcare services in the country—the expansion of the Universal Healthcare Law to cover free check-ups and laboratory tests, the Healthy Nanay and Bulilit bill (or the First 1,000 Days bill), the free medicines law, and the free dialysis for the poor bill. Senator Sonny is actively pushing for greater support for Filipino athletes as he sponsored the law that provided bigger cash incentives and benefits to winning national athletes, and included athletes with disabilities in the grant of incentives. He is also the sponsor of laws establishing sports academies and training centers in various cities and municipalities in the country to hone the skills of young athletes from the provinces. Sen. Sonny represented Aurora province for three terms in the House of Representatives (2004-2013) before he was elected senator in 2013. He is proud of having been a part of Aurora province's transformation from a provincial backwater to a growing tourist, agribusiness and investment destination. For his achievements, he was recognized as one of the Ten Outstanding Young Men for government service and legislation in 2010, and one of the Outstanding Manilans for public service in 2017. Senator Sonny is a graduate of Xavier School, the London School of Economics, the University of the Philippines College of Law, and Harvard Law School. He has been a regular newspaper columnist, and a professor of Law. He is the team captain of the Senate Defenders, the official basketball team of the Senate. He is happily married to wife Tootsy and they have three children.